I served it with spinach pasta, on the boy’s request…I definitely would have preferred polenta, but who has time for that at 1 p.m. with no lunch ready? Heat olive oil in a large sauce pan at medium high until liquid and fragrant. Add onions, stir to coat, and lower heat to medium. After five minutes, add garlic and peppers and pepper flakes, if desired. 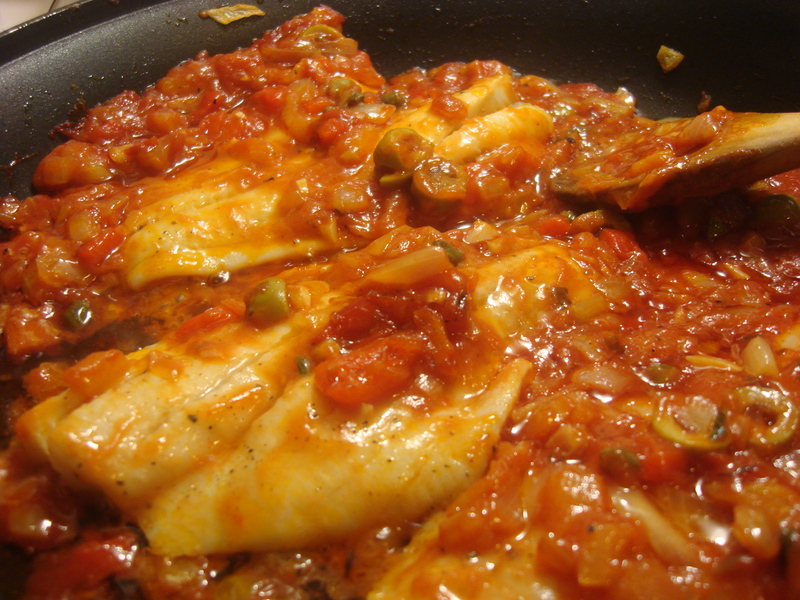 Cook an additional 5 minutes, until vegetables are tender, then add tomato sauce, olives and capers and cook at a lively simmer for 10 minutes. Meanwhile, lightly salt and pepper tilapia filets on both sides. When sauce has cooked until the oil is beginning to separate from the sauce, lay filets on the sauce without filets touching one another. Cook for about 4 minutes, then turn filets carefully (they will fall apart if you are not careful) and cover with sauce, cooking another 4 minutes or so (check for doneness – opaque flesh – with a fork). 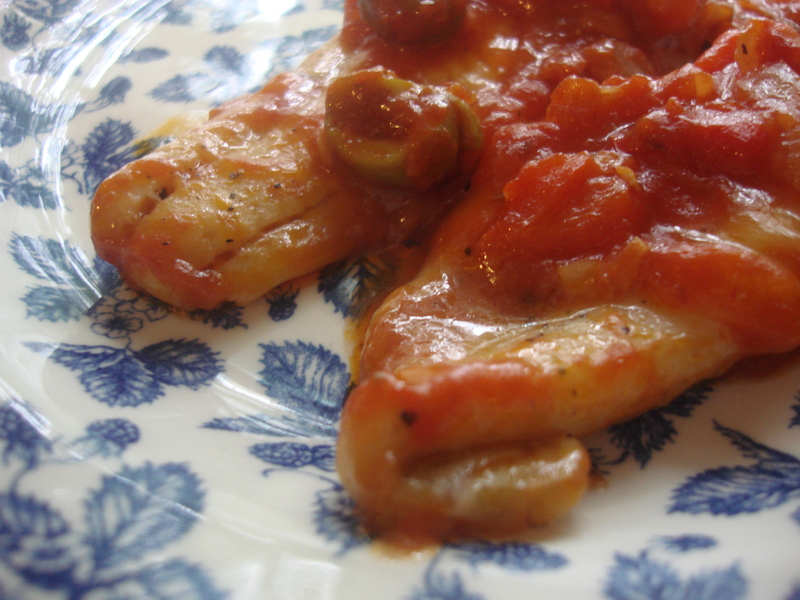 The genius of this recipe is that the fish won’t dry out if overcooked! Serve with rice or atop polenta. This reminds me a bit of snapper ponchatrain which is a house favorite. Wow, I’ve never heard of that! Sounds very, VERY intriguing….got a link? I do not, but I bet you can Google it and find more than one recipe. This sounds wonderful! I love fish, and I’ve never tried a recipe like this one. I think I’ll enjoy creating with this, so thank you! Thanks so much, Tami! This one goes well with all sorts of fish. Let me know how it turns out! I definitely will! 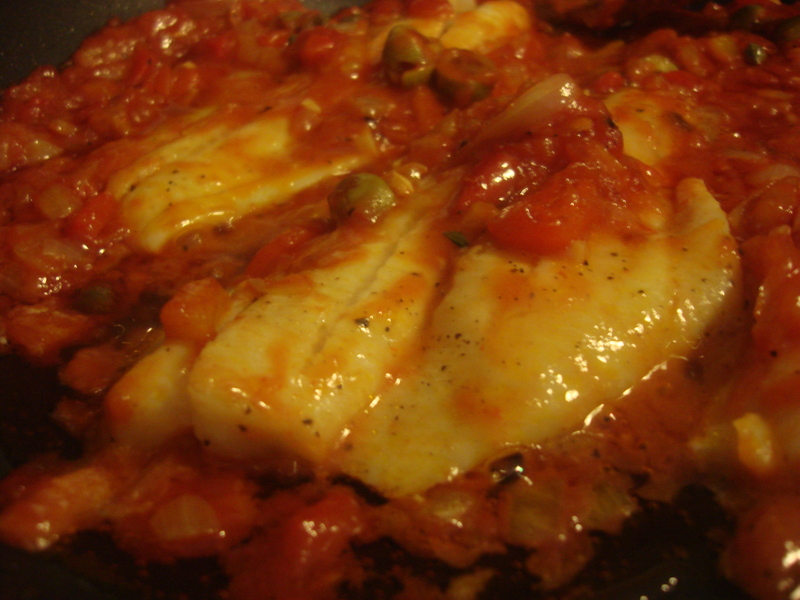 I have some beautiful Basa fillets in the freezer, I might make this for dinner tonight! I make a shrimp dish very similar to yours but have not tried adding roasted peppers. It must really add to the flavors and I can’t wait to try the recipe. Haha…every blogger has her secrets…. Diego y Dora… no puedo meterme mucho con ellos porque a Fernando (2 años y medio) le gusta mucho. En cuanto a Phineas and Ferb… we are huge fan at home (and Perry) (and Doofersmith, best evil personage ever). En cuanto al pescado, tiene una pinta deliciosa y si es así de versátil, estate segura de que lo haré muchas veces. Sounds delicous. Now, how do you drain something indifferently? Have you been watching Posh Nosh?